In the previous post, My Two Encounters with Korchnoi, I mentioned GM Korchnoi's defection from the USSR in 1976. I was reminded of this again while searching my image archive for a good photo of Korchnoi. The text description associated with the photo shown below said, 'An original 8 x 11 press photograph of Russian chess player Viktor Korchnoi from 27 July 1976.' The original wire service caption attached to the side of the photo was obscured by some sort of a printer's sticker, but along with the date a few words are still visible: 'IBM tournament', 'ministry sources', 'Korchnoi', 'UPI'. The photo was intended to illustrate the news of Korchnoi's defection. 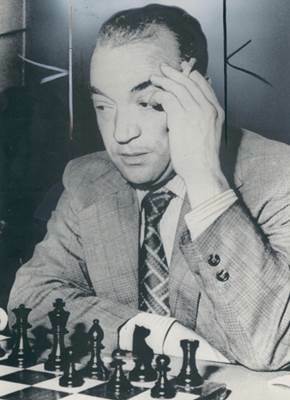 Strangely enough, the photo isn't a typical image of Korchnoi and almost looks like someone else. Perhaps he was tired that day or perhaps it's been altered somehow. The arrows on the side of his head indicate how the photo was to be cropped for publication. In July  I played in the IBM tournament in Amsterdam. As usual in recent times, I found it hard going, was often in time trouble, and with difficulty shared first place with [British GM Tony] Miles. Even then I was firmly convinced that it was now that I should stay behind in the West. I had decided to break with the Soviet Union, but for the moment, with the approach of the Candidates' Matches, the authorities were still interested in me, and I could still travel and collect as many valuables as possible -- in the West. I sent my archives off to Amsterdam, particularly precious letters from friends, and no less memorable ones from my enemies. But I was no longer able to keep silent. A week before the end of the tournament I gave an interview to a correspondent of the 'France Presse' agency. I talked about the reasons for Spassky's poor play in the Interzonal Tournament. Here he mentioned both the official harrassment of Spassky and the refusal of the Soviet Union to participate in the 1976 Olympiad in Israel. He called it 'the traditional policy of the Russian-Soviet State, the policy of anti-Semitism'. In giving this interview, I had used my right of being a free man; from this time, although I had never essentially bothered with politics, I had become a 'dissident', and an open one. While I had been in the Soviet Union, I had utilized all legal possibilities to show the Soviet people, using chess as an example, what was really going on in our country -- how it appeared in the press, and how it was in reality. From now on, if I were in the Soviet Union, there was no way I could be of use to people. With a clear conscience I took the decision -- to remain in the West, now and for ever. On the last official day of my stay in Holland, I should have appeared in the USSR embassy in the Hague with a report on the recently concluded tournament, at seven o'clock in the evening. But at half past five I finished a simultaneous display in the Hague, and went off to friends in Amsterdam. The following day, in a police station in Amsterdam, I asked for political asylum in Holland. The 1976 defection separated Korchnoi's life into two parts: before defecting and after defecting. The book 'Chess Is My Life' recounts the before period. He later wrote a second book 'Persona Non Grata (formerly titled "Anti-Chess")' recounting the after period (Thinker's Press 1981).